ARLIS was founded in 1972 at the initiative of Judith Hoffberg by a group of art librarians attending the American Library Association annual conference in Chicago. They formed a separate and specialized professional organization to fulfill the need among art librarians for better communication and cooperation, and to provide a forum for ideas, projects, and programs. The 2103 Art Libraries Society of North America Conference in Pasadena this past April 25–29 was the 41st edition of this annual event, and it sparkled in the Pasadena CA sunshine with stellar programs and special events, emphasizing the rich and diverse cultural landscape of Southern California, while at the same time featuring panels and presentations that were international in scope ever. Speakers and attendees came from the United States, Canada, Mexico, Latin America, Europe, and beyond, and included the Journal of Artists’ Books founder and editor, Brad Freeman. With the three other panelists (Tony White, Maryland Institute College of Art; Nina Schneider, UCLA, and Gretchen Henderson, MIT), Freeman presented to over 200 attendees at their panel session. He addressed the inevitable mash-up between artist’s books, considered hand-crafted and unique pieces of art, with the twenty-first century’s rapidly advancing technologies. The panelists each considered how the transformation of writing, publishing, and librarianship is creating a space where the traditional and historically hand-labor based form of artists’ bookmaking needs to navigate in order to survive and thrive. Freeman addressed how JAB and CBPA are embracing these new ways of working by encouraging ongoing critical inquiry of artists’ books, and embracing new iterations and evolutions of the form. 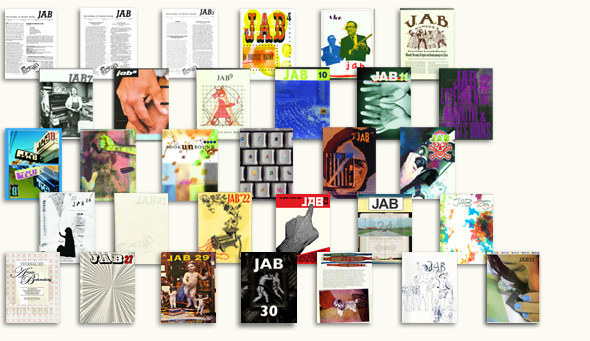 Freeman believes JAB and CBPA are contributing to the creation of future book artists and theorists through their Offset Fellowship program, where the fellows participate in not only the design and production of the printed version of JAB, but also in the writing and editing of the articles, as well as the content generation and design of its companion website, which contains some articles and features only available online. 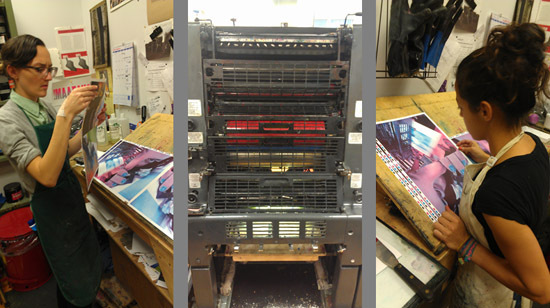 Offset Fellows Kate Morgan and Jenna Rodriguez, printing JAB33 on the Heidelberg GTO. This past year the Offset Fellowship was awarded to three InterArts Book and Paper MFA students at Columbia: Kate Morgan, Jenna Rodriguez, and Claire Sammons. The three have just completed their one-year fellowship terms. A call for applicants for the 2013-2014 Fellowship positions is expected to be sent out this summer. To find out more about ARLIS/NA, click here.